Who has the yummiest hot cross buns in Sydney? home > Eating out > Who has the yummiest hot cross buns in Sydney? Now, the supermarkets may have had these on the shelf since New Years’ Day, but that doesn’t stop us enjoying these soft, sweet, buttery treats. In fact, when you find a great one as far as we’re concerned, there’s no such thing as too much of a good thing. That’s why we’ve found and tasted the best hot cross buns in Sydney and we’re going to share them with you. 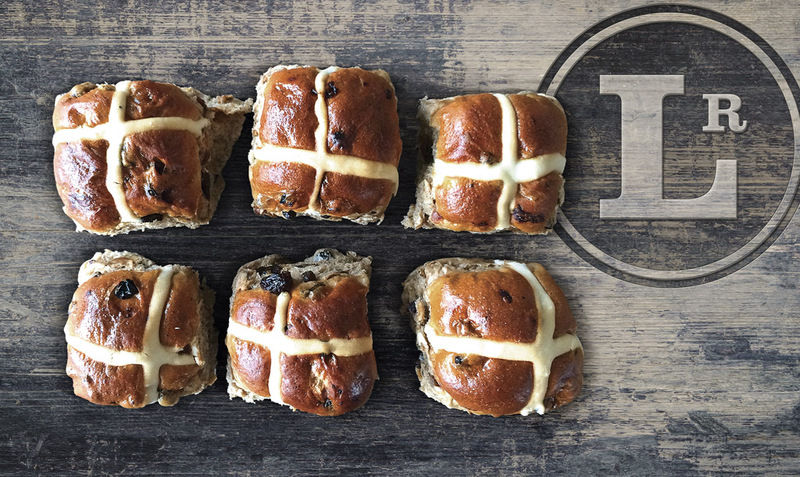 We love everything these guys create and their hot cross buns are no exception – or a slice of their hot cross loaf. Whether you enjoy it slice by slice, or treat it as one big hot cross bun, you’ll enjoy every bite. Soft, sweet and densely packed with dried fruit and peel, yum. With locations in Surry Hills, Potts Point, Alexandria, Marrickville, and Neutral Bay you could tour Sydney at the same time. These delicious hot cross buns are filled with fat juicy sultanas, raisins, spices and fragrant chunks of orange peel – all topped off with Frankincense glaze. And if you’re not sure what that is, it’s an infused sugar syrup which gives the buns a sticky gloss and a hint of perfume. Plus, these are vegan friendly. These manage to taste sweet and beautiful, without making you feel like you’re eating a cake. Intensely fruity but with small raisins and chunks of peel. Plus, if you’re taking one (or more) to go, they’ll send you off with a bit of butter too. These buns are marked with an ‘S’ not an ‘X’, so there’s no mistaking them being from anywhere other than Sonoma. These sweet little sensations are light, airy, with only a small amount of peel and some added cranberries for an extra kick. Found in Bondi, Paddington, Woollahra, Rose Bay, Glebe, Alexandria. These buns are light and soft, made with mouthfuls of cranberries, raisins, candied peel, spiced with cardamom and real Sri Lankan cinnamon. Perfect smothered in butter or enjoyed as they come. Posted in Eating out on 4th April, 2019 | Comments Off on Who has the yummiest hot cross buns in Sydney?